Rosa Louise McCauley Parks died this evening at her home in Detroit, with her friends at her side, at the age of 92. She was born on February 4, 1913 in Tuskegee, Alabama; she spent most of her life in Montgomery, Alabama, and then Detroit, Michigan. She was, of course, best known for her critical role in the Montgomery Bus Boycott and the development of the Freedom Movement in the American South. There are three things you need to know, and remember, about her life. Whatever the truth, [by fall 1955] Jo Ann Robinson, Mary Fair Burks, and the other [Women’s Political Council] members were tired of searching for the perfect symbol for their cause. No longer would they consult with male leaders about whether to stay off the busses. Their plans for a boycott were ready, and, at the very first opportunity, they would be put into effect, no matter what the men said. The black women of Montgomery, Robinson said later, were ready to explode. The woman who would provide the fuse was a light-skinned, forty-two-year old seamstress who wore rimless glasses and pulled her graying hair back into a neatly braided coil. Quiet, unassuming, polite–the perfect lady, so everyone said who knew her. Soon, she would stun them all, revealing some of the tortured complexity that lay beneath the prim facade. There was so much that was hidden about Rosa Parks. Even her appearance was deceptive. The coil at the nape of her neck, for example, concealed the fact that her hair was long, straight, and silky–a legacy, she said, from her Indian ancestors. When she pulled out the pins at home, her hair spilled down her back in luxuriant waves. I never cut my hair because my husband liked it this way, she told a friend years later. Just as few people ever saw Rosa McCauley Parks with her hair down, few knew about her Indian and white heritage, her deep racial pride, her smoldering anger, her lifelong rebellion against being pushed around by whites. Three of her four great-grandfathers were white. Her maternal grandfather, in whose home she was raised, was the son of a white plantation owner and light enough to pass for white himself. Sylvester Edwards loved to use his appearance to embarass and upset whites, shaking hands and speaking familiarly with those who didn’t know him, then laughing when they found out the truth. He delighted in calling whites by their first names and made jokes about them behind their backs. When the Ku Klux Klan rampaged through their small community outside Montgomery, Rosa McCauley’s grandfather kept a double-barreled shotgun by his side at all times. I don’t know how long I would last if they came breaking in here, he told her, but I’m getting the first one who comes through the door. His standing up to whites made a deep impression on his small, slight granddaughter, who received a further dose of racial pride when, at the age of eleven, she enrolled in Miss White’s school in Montgomery. Officially known as the Montgomery Industrial School for Girls, Miss White’s was founded by white teachers from New England to teach domestic skills, as well as academic subjects, to black girls. The teachers at Miss White’s were shunned by the rest of the city’s white population, and th school was twice set afire. The white community’s fear that the school’s curriculum included racial equality as well as cooking and sewing was not misplaced. It was no accident that several of the women most active in the Montgomery Bus Boycott had attended Miss White’s. What I learned best at the school, Parks wrote, was that I was a person with dignity and self-respect, and I should not set my sights lower than anybody els just because I was black. More than once as a child, she put those lessons into practice. When she was ten, a white boy threatened to hit her. She responded by threatening to smash his head in with a brick. Another time, a white boy on roller skates, careening behind her on the sidewalk, tried to push her aside. She turned and pushed back. His mother, standing nearby, told the little girl that she could put me so far in jail that I never would get out again for pushing her child. By the 1940s, the fire in [her husband, and NAACP organizer] Raymond Parks had damped down. He had tried for years to register to vote but had not succeeded. Finally, he just gave up trying. Now, Rosa took up the banner. Raymond Parks had long discouraged her from joining the NAACP–too dangerous for a woman, he said. But in 1943, Rosa found that the local chapter had at least one female member–her old friend from Miss White’s school, Johnnie Carr. Rosa decided to go to the December meeting to see Carr and take a look at the organization for herself. The meeting, which Carr didn’t attend, turned out to be the annual election of officers. The men said they needed a woman to take the minutes, and Parks, the only woman present, agreed. I was too timid to say no, she explained. She paid her membership dues, was elected secretary on the spot, and from that moment on, threw herself into civil rights work with a singular passion. Despite her modern image as a simple seamstress who just happened to get on a bus one day and ignite a movement, Rosa Parks, together with E. D. Nixon, was the mainstay of the Montgomery NAACP through the 1940s and 1950s. On her lunch hours, in the evenings after work, and on weekends, Parks would be in Nixon’s office, answering phones, handling correspondence, sending out press releases to newspapers, keeping track of the complaints that flooded in concerning racial violence and discrimination. As much as he depended on her, Nixon had litle use for women as activists. One time he told Parks that women don’t need to be nowhere but in the kitchen. She shot back: Well, what about me? Realizing he had painted himself into a corner, Nixon came back with a lame reply: … I need a secretary and you are a good one. She was much more than that. In the early 1940s, she helped organize the local NAACP Youth Council and became its adviser, encouraging its teenage members to try to integrate the local white library. Childless herself, she loved working with youngsters, who, in turn, responded to her warmth and enthusiasm. –Lynne Olson (2001): Freedom’s Daughters: The Unsung Heroines of the Civil Rights Movement from 1830 to 1970 , pp. 95-97. 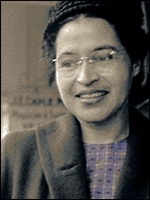 On December 1, 1955, less than two months after Mary Louise Smith’s arrest [for refusing to give up her seat on a segregated bus], Rosa Parks waited for a bus to take her home from work. She was just steps away from the Winter Building, where the order had been given in 1861 to fire on Fort Sumter and ignite the Civil War. Shortly after five o’clock, a bus pulled up to the stop. Absorbed in thought about an NAACP workshop she was planning for that weekend, Mrs. Parks didn’t notice the driver until after she had paid her money and boarded. As she sank into a seat in the black section’s front row, she realized with a jolt that he was the same man who’d thrown her off some twelve years before. The bus lumbered down Montgomery Street and stopped in front of the Empire Theater, where several whites got on and sat down in the first ten rows. One man was left standing. The driver turned to Parks and the other blacks sitting in the next row. Let me have those front seats, he said. When nobody moved, he barked, Y’all better make it light on yourselves and let me have those seats. The man in the window seat next to Parks stood up and moved back, as did the two women across the aisle. Parks simply moved over to the window seat. She sat there, remembering how her grandfather kept his shotgun by the fireplace or in his wagon, remembering how he refused to be terrorized by the Klan, even when everyone else was. She remembered, too, how wonderful it had been at [Highlander Folk School] to feel like an equal with whites. At that moment, she decided it was time that other white people started treating me that way. Years later, she would declare: People always say that I didn’t give up my seat because I was tired, but that isn’t true. I was not tired physically, or any more tired than I usually was at the end of a working day. I was not old, although some people have an image of me as being old then. I was forty-two. No, the only tired I was, was tired of giving in…. There had to be a stopping place, and this seemed to have been the place for me to stop being pushed around …. I had decided that I would have to know once and for all what rights I had as a human being and a citizen, even in Montgomery, Alabama. The driver asked Parks if she was going to stand up. She looked at him. No, she replied. Well, he said, I’m going to have you arrested. She answered quietly: You may do that. It was a moment of profound personal significance. For most black Southerners, the idea of agreeing to go to jail, of voluntarily submitting themselves to a dreaded legal system that had oppressed and killed so many blacks before them, was unthinkable. But doing the unthinkable, rising above the fear and shame of the jail experience, would turn out to be an exhilarating act of personal liberation–for Rosa Parks and the blacks, young and old, who followed her. Here was an individual, virtually alone, challenging the very citadel of racial bigotry, Pauli Murray said ten years later. Any one of us who has ever been arrested on a Southern bus for refusing to move back knows how terrifying the situation can be, particularly if it happened before the days of organized protest and we had neither anticipated nor prepared beforehand for the challenge. The fear of a lifetime… is intensified by the sudden commotion and the charged atmosphere in the cramped space of the bus interior. As the driver, James Blake, got off the bus to call the police, Parks sat in her seat, trying hard not to think about what might come next, trying not to worry about being manhandled as Claudette Colvin and countless others had been. A few minutes later, two officers boarded the bus. One of them asked Parks why she didn’t stand up. She replied with a question of her own: Why do you all push us around? I don’t know, he said, but the law is the law, and you’re under arrest. The policeman picked up her purse and shopping bag, escorted her off the bus, and put her in a squad car for the ride to the city jail. At the jailhouse, Parks asked if she could have a drink from the water fountain and was told it was for whites only. She was then fingerprinted, booked, and put in a cell with two other black women, one of whom gave her a drink of water from a dark metal mug. Meanwhile, word of Parks’s arrest had begun to spread throughout black Montgomery. A neighbor of E. D. Nixon’s saw her being escorted by the policemen off the bus and immediately notified Nixon, who, in turn, called [white civil rights activists] Clifford and Virginia Durr. Nixon and the Durrs rushed down to the jail to bail out Parks. As Parks emerged from her cell, matrons on either side of her, the first person she saw was Virginia Durr. Tears in her eyes, Durr threw her arms around Parks. They hugged and kissed, Parks later recalled, as if they were sisters. And finally, you should know how much she did, and how much we all owe her. 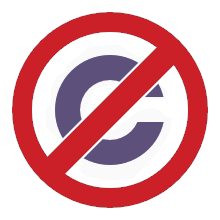 Now that the boycott was over, there was some carping, particularly by whites who opposed it, that the protest, in fact, had accomplished nothing, that the Supreme Court, not the boycott, had ended Jim Crow on the city’s buses. What could they possibly gain from the boycott that they can’t gain from the federal courts? Joe Azbell, city editor of the Advertiser , had grumbled early in the protest. What could they gain? A sense of dignity, self-respect, and power; a feeling of community; a determination to claim basic rights; a loss of fear–victories that were nothing short of revolutionary for blacks in the Deep South in the 1950s. The Ku Klux Klan of Montgomery discovered for itself what blacks had achieved when, on the night after the Supreme Court ruling, some forty cars loaded with white-hooded thugs cruised slowly through black neighborhoods. There was no panic, no dread; instead, blacks jeered and laughed and shook their fists as the Klan drove by. Disconcerted by their failure to terrorize, the Klansmen drove away. Virginia Durr remained close to Rosa Parks, whose own life had also become much more difficult. During the boycott, Parks had devoted herself to the cause, traveling, making speeches, raising money. She served on the [Montgomery Improvement Association]’s executive board, worked as a car pool dispatcher, handed out clothes and food to people who had been fired because of their civil rights involvement. After the boycott was over, she tried to get another job in Montgomery, but no one would hire her. She had little income except the money she made from sewing at home and from funds that Virginia Durr had raised for her in appeals to the Highlander Folk School and to some of the Durr’s more affluent Northern friends. To be a heroine is fine, but it does not pay off, Durr tartly observed. However she may have felt about not being given credit, there is no question that Parks moved to Detroit primarily because she needed a job. Even there, she had difficulty finding work. She finally took a position as a hostess at a guest house at Hampton Institute, a black college in Virginia, but when Hampton reneged on an implied promise to provide an apartment for her, her husband, and her mother, she returned to Detroit, where she first worked for a seamstress friend and then in a clothing factory. Not until 1965, when Representative John Conyers, Jr., hired her as a receptionist in his Detroit office, was she finally able to achieve more than a hand-to-mouth existence. Her friends, meanwhile, were appalled that she had been allowed to slip into the shadows of civil rights history. Her image, as crafted by King and the other male boycott leaders, was that of a tired seamstress who had been tracked down by the Zeitgeist–the spirit of the times. When Septima Clark saw a documentary about the boycott, she noted that Parks was hardly mentioned. We talked about it, she and I, Clark said. 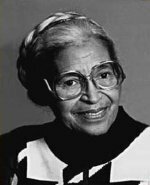 She gave Dr. King the right to practice his nonviolence … It was Rosa Parks who started the whole thing. E. D. Nixon made the same point to a woman sitting next to him on a plane one day. When the woman found out Nixon was from Montgomery, she said she did not know what would have happened to black people if King had not been there to lead the boycott. Nixon replied: If Mrs. Parks had got up and given that white man her seat you’d never aheard of Dr. King. When South African freedom icon Nelson Mandela came to Detroit in 1990, the person he was most honored to meet was Parks. When he got off the plane, a line of dignitaries waited to greet him. Mandela simply stood in awe when he saw Parks. He chanted, Rosa, Rosa, Rosa Parks! . recalled Keith, who had escorted her to the airport to meet Mandela. He recognized her before he recognized anyone, Keith said. Mandela later told Keith that Parks was his inspiration while he was jailed and her example inspired South African freedom fighters. Mandela called Parks the David who challenged Goliath in a 1993 speech at the NAACP convention in Indianapolis. The best-selling poet and writer Maya Angelou said of her, Mrs. Parks is for me probably what the Statute of Liberty was for immigrants. She stood for the future, and the better future. Angelou recalled the pleasure of having Parks as a guest at her home in Winston-Salem, N.C., several years ago. She was as tender as a rose and she was as strong as steel. Here is how she wanted you to remember her. Parks’ health had been declining since the late 1990s. She had stopped giving interviews by then and rarely appeared in public. When she did, she only smiled or spoke short, barely audible responses. In one of her last lengthy interviews with the Detroit Free Press in 1995, she spoke of what she would like people to say about her after she passed away. I’d like people to say I’m a person who always wanted to be free and wanted it not only for myself; freedom is for all human beings, she said during an interview from the pastor’s study of St. Matthew African Methodist Episcopal Church, a small congregation she joined upon moving to Detroit in 1957.